Later this year I will begin to start seriously considering options for work next year – these options will be slightly constrained by a certain other structure that will come with the next two years (Yeah that thing I can’t talk about yet again, which is a little annoying, because it’s kind of fun, but could affect location). Alongside design firms I will also be checking out some publishers – like Penguin – in some kind of weird endeavor to combine my two loves. Speaking of Penguin Books, there have been another 50 titles of popular penguins released for the lovely low price of $9.95(ish) each. 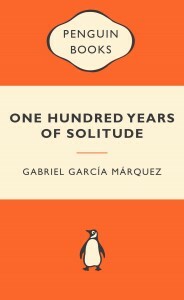 I was very pleased to see that One Hundred Years of Solitude has made the list. So get off your bum and go get yourself this rather fine piece of literature. Yes it’s a little peculiar, and a little bit of a hard slog with so many similar names but it’s very worth it.